Today I am launching Modus Operandi Monday (MOM). A modus Operandi is a particular way or method of doing something. That is what I hope to bring to you every Monday. Today I am going to show you a wonderful alcohol technique on foil, I found by CindyScrapperV. 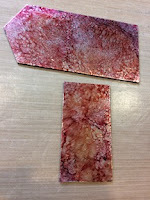 Items you will need for this technique are Aluminum Foil (cheap stuff), Alcohol Inks (as many colors as you want). I used Ranger's Mermaid, Purple Twilight & Ginger. Alcohol Blending Solution, Blending pads, chipboard, glue. 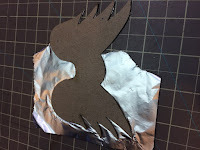 Lay out a piece of foil and lay your chipboard piece on it and make a few marks to indicate the size of your chipboard. You will need to cover all that area with the inks. 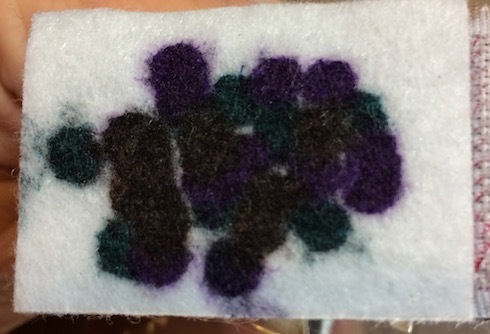 Put a few drops of the ink (as many colors as you want) on your pad. 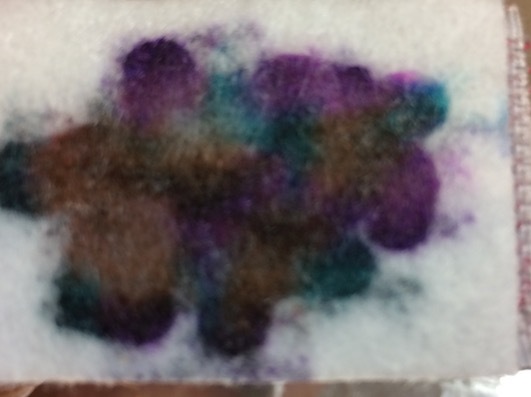 Add a few drops of the Alcohol Blending Solution on the spots of ink. It will appear slightly faded. Don't over add the solution unless you really want a muted look. 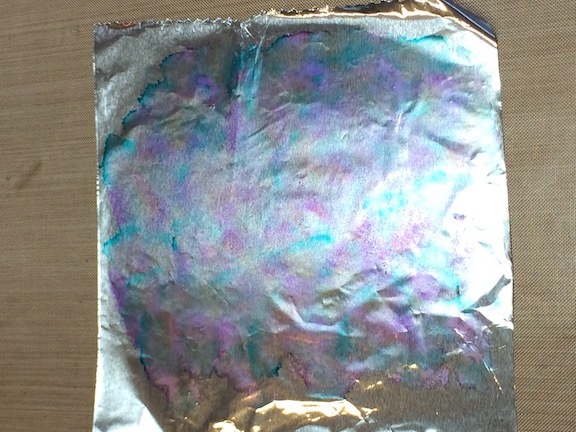 Now start stamping the ink on top of your foil. Tap as many times as you want and the design will change as you go. Be sure to cover the entire area where your chipboard will go. 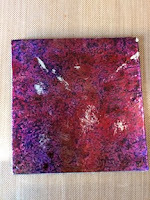 I allowed it to dry for a minute, then started stamping again. 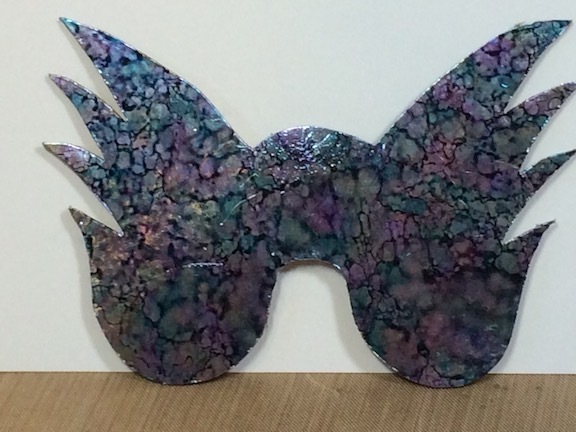 Once you have the look you want, use your heat gun to dry it. When it is dry, turn it upside down, put glue on the side of your chipboard you want to cover with the foil and glue it to the back side of the foil. Once the glue is dry, use an Xacto knife and cut away the foil close to the edges of the chipboard. Smooth over the edges over with your finger. This was my finally result. I also tried using some foil sheets (Dollar Tree) and used the left over ink on the pad with more of the Ginger ink. These foil sheets had a texture in them, small dots. 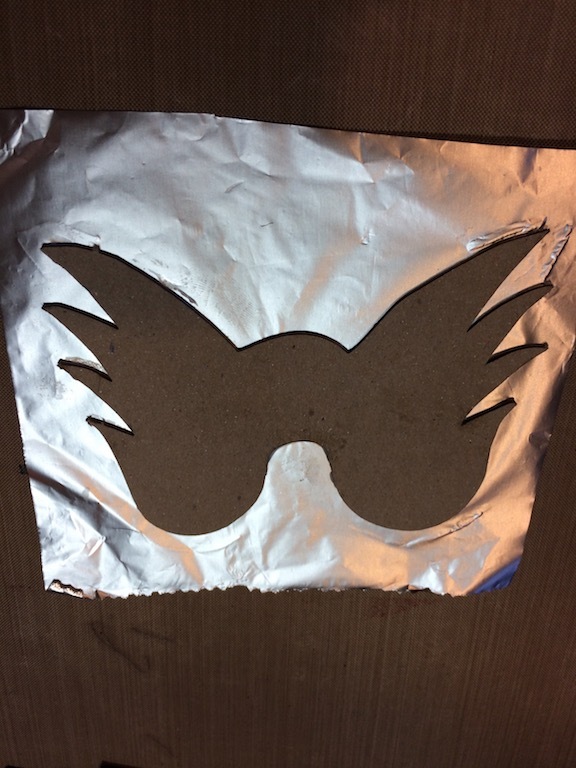 This was the result using the foil sheets. I noticed that since the sheet has a shiny and dull side (like all foil) the side with the dots outward was the shiny side and did make the inks shiny. On the dull side with the dots inward, it was more muted and there was more of a shadowing effect in the inks. They both turned out nice. I do hope you try this technique and have as much fun with it as I am having. Thank you for stopping by and Happy Scrappin!!!! Here are some more samples. 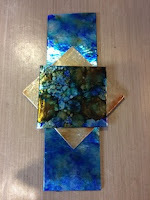 On this piece I used the same colors but most of the concentration of color is on the small square, which I inked first. 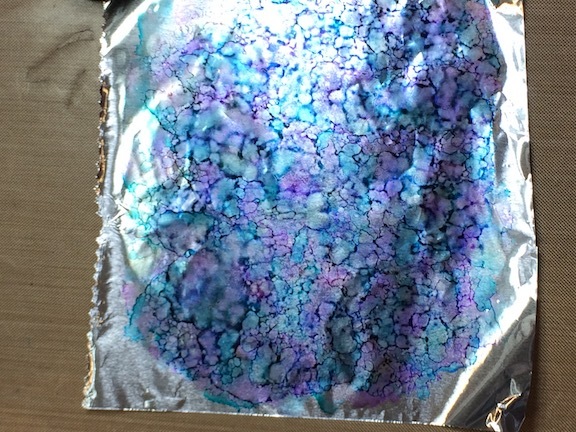 As the ink was fading on the blending pad, I put it on another section of foil so the design is not as intense. The center square was with just (1) color of ink (my first test piece). On this sample, I put a lot of the Alcohol Blending Solution on the pad and it really blending the colors. 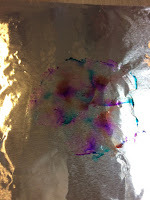 I also used a baby wipe and removed some of the ink before it was dry to reveal the silver foil. On this one, the ink was being used up from the sample above, so I added a little more red ink to the blending pad. 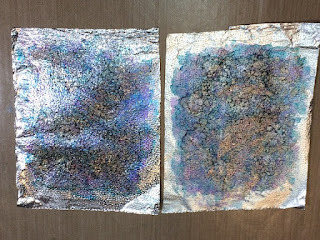 Then I added the yellow ink directly on the foil in spots and blended it using the same blending pad. 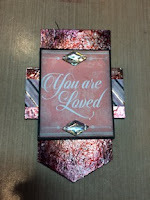 I glued the 2 pieces together, added some crafting tape, a tag from #graphic45 #monamour collection and two stones. This is the result. This technique is a must try for sure! Save that broken blow dryer, drill, etc.